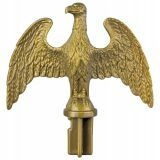 Our Outdoor Flag Pole Ornaments will add a perfect finishing touch to your flag display by adding elegance and beauty. It is impossible not to fall in love with these exquisite masterpieces that remain testimonies of finesse and craftsmanship. Though nothing is prouder than the flag, it is these flag pole ornaments that add the much desired aesthetic beauty to the flag presentation. Shop from our collection of Outdoor Flag Pole Ornaments right away and avail the best prices, quick shipping and much more! 100% customer satisfaction guaranteed! Deck up your flag presentation with these pretty flag pole ornaments from Tuff Flags and impress your audience and create memorable snap shots. 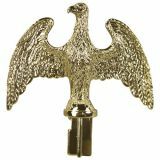 Choose from a range of beautiful Flag Pole Ornaments including Gold Gilt Finished Plastic Eagleand Brass Plated Gold Plastic Eaglegold tinged eagles for both steel and aluminium flagpoles. 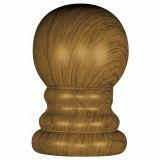 If you are looking for a classic ornament to round off the flag display, this wood grain ball ornament will make a great choice. Made to look good and last long, these ornaments are what make flag displays truly special and dramatically beautiful.